There are still a few misconceptions about cloud computing. Because of this, company managers often veer between two extremes: they either embrace the cloud totally or simply disregard it. The problem generally occurs when the CTO of a company focuses on the infrastructure cost savings instead of taking a holistic approach. Here are a few areas which organizations must look at before migrating to a cloud platform. This aspect of cloud infrastructure is obviously the beginning point. In the case of dedicated servers, we have to look at the actual expenditure. This includes the hardware, network and data center expenses and the cost of spares in case of emergency. The software expenses would include operating systems, applications and specialized tools. The hardware and software expenses must be calculated on an annual basis. Many online enterprises like gaming portals, e-commerce, music streaming and download sites experience fluctuating loads. The cost of adding or eliminating hardware (servers) annually must be calculated. We must keep in mind that opportunity costs must be arrived at using reasonable assumptions. Technical staff salaries are higher compared to other vocations. We must remember that technical staff can be replaced or augmented by using resources provided by cloud vendors, which can be a big plus. Learn more about facilities which can reduce the cost of employing permanent technical staff. Online entities cannot afford any downtime. However, traditional data center operations fall prey to error conditions and failures due to several factors. Server overload can lead to deteriorated user experience leading to poor fulfillment. The cost to the company, in such circumstances, cannot be easily determined. Usually IT infrastructure in any organization tends to be dispersed and distributed. The ownership of these systems and processes is also not clearly defined. This situation can be frustrating for actual users, since there is no accountability and no one is centrally responsible for the entire IT infrastructure. The cost due to this diffused operational condition can be considerable. When contemplating migration to a cloud platform, an organization must unify all operations and bring them under one single communication system. This will benefit the organization and lead to better efficiencies. This is an era of collaboration – not only within an organization but also with others outside. Supply chain management systems work well only if the vendors from the purchase side and the distributors from sales are brought together to work closely as a team along with the organization. Cloud infrastructure provides an excellent environment for such collaborative practices. The cost of running a traditional IT infrastructure is therefore not limited to hardware expense alone. When migrating to a cloud environment, we must always look at the big picture. New systems and processes must be exploited to derive maximum benefit from technology. New opportunities to consolidate diverse operations must be explored. Collaborative environment should be nurtured and consciously developed leading to better efficiencies. Embracing cloud computing is a matter of having a mindset geared towards advancement and future growth. How Does the Cloud Benefit the Tourism Industry? With growing business demands, every industry needs to scale up resources. This is especially true of the tourism sector with its fluctuating demands. Festive seasons vary with location and culture, and travel agencies need to scale up resources during peak times and scale down resources on low days. It is not a feasible idea to purchase infrastructure and manage it equally all days. With a cloud-based infrastructure, travel agencies can enjoy highly scalable resources while paying only for hours used. For a better illustration, check out High Availability features of GMO Cloud Hosting. To stay ahead of their competition, travel agencies need to provide high quality services that are quick, easy to use, efficient, and reliable. This is what cloud computing services offer. By moving to the cloud, travel agencies can afford to run robust networks that can handle huge traffic. In addition, travel websites need to depict the beauty and elegance of travel destinations and make them enticing to potential clients. Streaming audio and video requires high-end IT networks. Today, travel agencies need to offer comprehensive travel packages. Right from booking flight tickets and local transportation to reserving hotel rooms, the travel agency needs to take care of every aspect of travelers’ needs. Visitors need to search huge volumes of data to design their tour programs. Cloud computing is the right solution, as the technology offers highly efficient data management solutions that can cater to businesses of all sizes. One of the most important requirements of a travel website is security. People use credit cards to book travel tickets, and when sensitive information is passed on to the site, it is extremely important that it passed through secured gateways. Even if you purchase secure network solutions (which isn’t really feasible), you need to monitor them and update them on a regular basis. With a cloud-based service, you don’t need to worry about security solutions. Highly secured networks are engineered and maintained to offer a robust network that is simple to use, efficient, reliable, and highly secure. With a cloud-based service, the travel agency gets the flexibility to create highly intuitive software solutions at affordable prices. The cloud infrastructure offers an ideal platform to design intuitive software solutions for travel needs. Your website visitors can access web applications and book tickets from anywhere using any mobile device or PC. Businesses that embrace the cloud will stay ahead of the competition. Big Data Can Also Mean Big Errors! The Sloan Digital Sky Survey back in the year 2000 generated more astronomical data in a few weeks than had been generated by astrophysicists in the entire history of astronomy. The Chile-based Large Synoptic Survey Telescope will generate this quantity of data every five days once it goes online in 2016. If you think that this type of data can only be generated in space, think again. Wal-Mart handles more than a million transactions per hour and its databases are estimated to be about 167 times larger than all the books in the American Library of Congress. Similarly Facebook has 40 billion+ photographs, and the human genome with 3 billion base pairs — both examples of enormous data sets. While it is fashionable to say that analysis of big data hold all the possible answers, there are a number of issues that need to be understood. 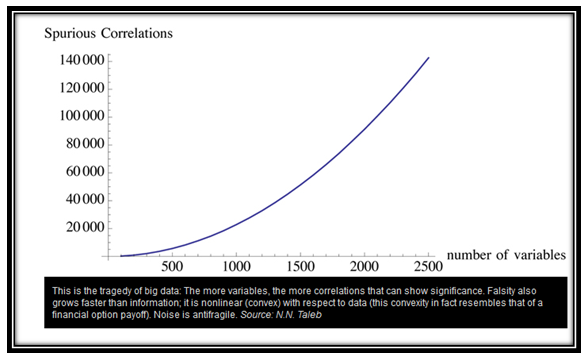 When large amounts of data are analyzed, many correlations emerge, i.e. a situation when A implies B. In such a situation, if A increases, then B increases as well. However, as the number of variables increases, the number of chance correlations increases as well. A chance correlation is just a random coincidence. N.N. Taleb, in his book “Antifragile: Things That Gain from Disorder”, describes how the number of spurious correlations grow as the number of analyzed variables increase. This, Taleb says, is the problem with big data. The number of spurious results can be larger than the number of accurate results by a factor of as much 8 times! Should we dismiss big data then? Does it have no value if the spurious results are so many? Fortunately, the answer is no, but it does point to the pitfalls of using statistics recklessly. With the growing use of big data and its possible correlations, statisticians are suddenly back in demand. I previously discussed a situation where a retail store chain was using its vast databases to determine if a customer was pregnant. Statistics played a big role in that research and even more powerful statistical analysis is now being brought into play. Fortunately, the inherent power of the cloud means that more and more complex analyses are now possible, if only one knows how to do it. What this means is that statistics as a career option is becoming increasingly popular too. Cloud computing and big data have ensured that the nerd who really understands statistics will be able to command his or her own price. The CIO in companies is now becoming an integral part of strategy meetings. Since this analysis is such an integral part of company strategy, it is critical that the cloud infrastructure companies use is robust and reliable. For an example, check out GMO Cloud’s High Availability page. CIOs are careful to choose great statisticians and great cloud service providers. Both are essential for a good night’s sleep! A quiet revolution in data storage has occurred in recent years, with consumers all around the world enthusiastically adopting cloud storage services for their daily needs. This year seems to be a pivotal year in this massive data migration. It is expected that by the end of 2013 nearly 615 million people will be using the cloud to store their personal data. This is amazing when you consider that at the end of 2011 there were about 150 million people storing their data on consumer storage clouds. The number could reach 1.3 billion people in the next four years. What is causing this massive migration to consumer cloud storage? One of the most important factors that has benefited cloud service providers and consumers is the wide availability of mobile broadband and high speed online access. We have reached a point where it is often more practical to store data in the cloud and to have nearly instant access to it from anywhere. The most important technology firms such as Google, Amazon, Microsoft, and Apple have followed this trend, delivering virtualized services to expand their markets rapidly. Many cloud storage providers that have popped up recent in years as well, the most notable of which are probably Dropbox, Mozy, and Carbonite. Today it is possible for most consumers to get at least two to five gigabytes of free cloud storage from most providers, which have adopted a freemium model with different tiers depending on the amount of storage. Is this cost effective for these cloud storage providers? Perhaps not in the long term. Many of these transactions continue to lose money for the companies in question. However, the potential for monetization lies in the ability of these companies to partner with mobile and cloud service providers in order to provide other services that can go well with data storage. Like GMO Cloud, there are other services these companies can subscribe to that everyday consumers can benefit from. Nowhere is this consumer adoption of cloud services more obvious than in the Asia Pacific market. Studies show that the APAC region is set to process more data in the cloud than many other place in the world. By 2016, it is expected that nearly 40% of cloud workloads will occur in Asia. Leading this trend are five countries: Japan, Hong Kong, Singapore, South Korea, and Taiwan. These countries’ combination of advanced IT infrastructure, high broadband speeds, and adequate government regulation have resulted in an environment conducive to the development of a robust consumer cloud storage and cloud services market. However, the real strength of the Asia Pacific market lies in the fact that many emerging economies in this region are also making a strong investment in technology and cloud computing. Countries like China, Vietnam, Cambodia, Malaysia, and Thailand are set to contribute to the growth of consumer cloud storage and other services in the region. The year 2014 will be a pivotal year, it will be the first time when more than half of all computing in the region is done in the cloud rather than by traditional means. This trend is occurring worldwide. It is predicted that by 2016, the global computing processing traffic in the cloud will quadruple, mainly in the areas of data storage, and in the areas of production and development. About 17 percent of cloud traffic by 2016 will be directly fueled by consumers using the cloud for storage or things like video and audio streaming. While the Asia Pacific market will lead the way in the development of the cloud, it is important to remember that this is a global trend which will also see growth in places like Africa, South America, and the Middle East as well.